On April 28, 1989, William Thornton, president of the Manchester Sand & Gravel Company paid the last state highway toll in Connecticut on the Charter Oak Bridge. It was a prearranged moment of symmetry for, when the bridge opened in 1942, Thornton had been the first person to pay the toll at just 13 years old. 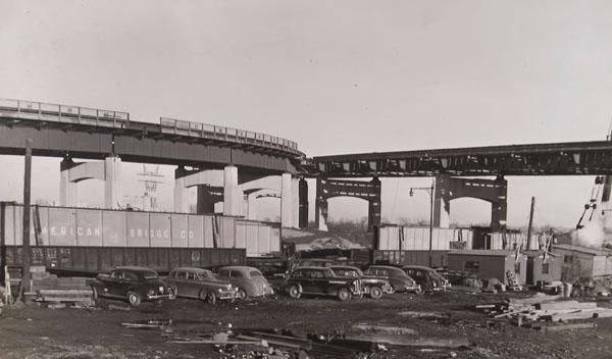 Connecticut has a long history with toll roads. Between 1792 and 1839, about 100 private turnpike corporations were chartered; they built 1,600 miles of toll roads, or turnpikes, across the state. These private corporations were businesses that built and maintained these roads in order to collect fees from travelers. Connecticut became the second state in the country to form a highway department in 1895 and by 1908 this department took over the management of 1,000 miles of roads. Tolls were often used to defray the expense of improvement and maintenance. By 1955, Connecticut began construction of a 129-mile-long, controlled-access toll highway connecting New York City to Rhode Island, the Connecticut Turnpike. The project started before the Federal-Aid Highway Act of 1956, so the eight barrier toll plazas remained in place even after the highway became an integral part of the Interstate Highway System (I-95). In 1982, protests from community groups such as “Banish All Tolls” began pressuring the legislature. The tolls were seen as an unfair barrier to commuters; they wasted gas, caused congestion, and created noise and hazardous air pollutants. A horrific accident in January 1983 at the Stratford toll plaza added more pressure, prompting the Connecticut State Highway Department and the legislature to examine the tolls from a safety standpoint. The decision was made to remove the eight toll plazas on the Connecticut Turnpike and the one on the Bissell Bridge by December 31, 1985. In 1986 additional legislation required the closure of the tolls on the Merritt and Wilbur Cross parkways by 1988. The Charter Oak Bridge in Hartford has the distinction of collecting the state’s last toll. The Boothe Memorial Park and Museum contains one of the toll booths removed from the Igor I. Sikorsky Memorial Bridge on the Merritt Parkway.